Keep track of your finances 24/7. Anytime, anywhere, any device. It's simple. Takes just a couple of minutes to set up. It's convenient. Bank wherever, whenever – 24/7. It's safe. Feel protected against fraud with NAB Defence. It's quick. Fast NAB-to-NAB transfers with SMS Security1. Transfer funds and pay bills to anywhere in Australia. Whenever you want. Transfer up to $40,000 a day2. Create or update PayIDs for your eligible accounts. Redraw funds from your personal loan or home loan. No waiting. No wondering. Schedule your funds transfers and BPAY® transactions in advance. Set and forget3. Access your account balance and transaction history whenever you want. Free anti-virus software gives you peace of mind when using the internet. Ever misplaced your card? You can now block and unblock your cards instantly. View, download, print and order your NAB Statements whenever you want. Clear the clutter. Open a new account – or apply for a loan or credit card – online. Our customer-friendly forms make it a breeze. With our email alerts, you'll never miss a payment. Do your banking on your phone – transfer, pay and receive funds, including fast payments4, and pay your bills. Transfer up to $40,0002. Share payment receipts via SMS, email or save them to your phone. Create PayIDs for your eligible accounts. Our optional Quick Balances feature tells you now how much money you've got. No login required5. Tap and pay on the go with NAB Pay for Android and NAB PayTag for iPhone. Bank at a glance with Apple Watch. Choose how and when you use your Visa cards through the "My Cards" menu - turn on and off contactless purchases, transaction notifications, overseas transactions, online shopping and credit card cash advances. Don’t remember that purchase? You can now view more details for purchases made on your Visa credit and debit card, including merchant name, address, purchase date and map. Travelling overseas? Let us know when and where you're travelling to help us ensure your cards keep working, plus we'll monitor accounts even closer to protect you against fraud. Schedule your funds transfers and BPAY® transactions to go through when you need them to. Make international payments using real-time rates6. NAB Alerts – sent by SMS – remind you of your payments. Log in using Touch ID for iPhone. Download the iPhone, iPad or Android app6. Tap into more control, more piece of mind and more freedom. Tap and pay with your Android phone using NAB Pay. It's just as secure as your NAB Visa Debit card. Check your funds at a glance with Quick Balances. Or find your nearest NAB. Keep your password secret. Don't even tell your mum. Protect yourself with a password lock that can be set up in your Internet Banking settings. Don't use your date of birth, telephone number, address, your name or the name of a friend or relative in your password. Ensure your computer has up-to-date anti-virus and anti-spam software. We offer our customers free security software to give you peace of mind when banking online. 1. Your NAB Identification No. This is located on the back of your NAB Card, above the magnetic strip. At some stage, we'd have provided this to you in a branch. If you’re a business customer, your business NAB ID is given to you in person by your business banker or over the counter at a NAB branch. If you need help call us on 1300 651 656 from 7am-9pm Mon-Fri, or 9am-6pm on weekends (AEST/AEDT), or visit any NAB branch. 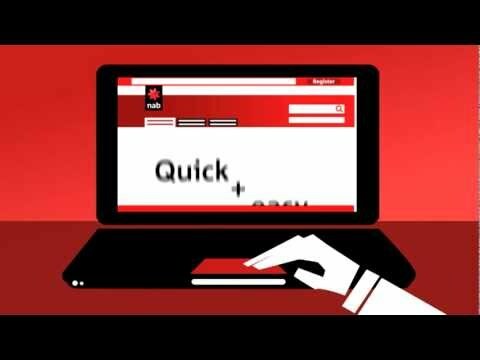 Follow these steps to get you ready and set up for NAB Internet Banking - it's easy! Internet Banking is here to help you get Tax-Ready for End of Financial Year. 1 Your first payment to other NAB payees will take 24 hours (as a security precaution). Payments to non-NAB payees made on a weekday by 6pm will be submitted when you make the transfer. However, other banks and financial institutions may take longer to process your payment. 2 For increased payment limits, please contact us on 13 22 65. Increasing your limit may increase your liability for unauthorised transactions. You may want to consider your limit and only increase it to suit your needs or for a large one off payment. 3 BPAY® is a registered Trademark of BPAY Pty Ltd ABN 69 079 137 518. 4 Fast payments only apply to your eligible accounts. 5 Selecting our optional Quick Balances feature will disable your SMS account balance notifications. 6 Apple®, iPhone®, iPad® and the Apple logo® are trademarks of Apple Inc., registered in the U.S and other countries. App Store® is a service mark of Apple Inc. Google and the Google Logo are registered trademarks of Google Inc. © 2012 Google Inc. All rights reserved. Ready to get started with internet banking? What is creditworthiness and why does it matter? Meet your everyday bank account. Easy access to your money with no monthly account fees.